Manage your money in real time, easily and effectively, even by mobile. For you it's free for 14 months. Then you can cut the monthly cost by using your card or limiting withdrawals. In just a few steps, set your budget and monitor your spending to understand where, how and how much you’re spending. MoneyMap does the rest: it groups your spending into automatic or personalised categories and tells you when you spend more than expected. Download the Fineco app and start saving right away. 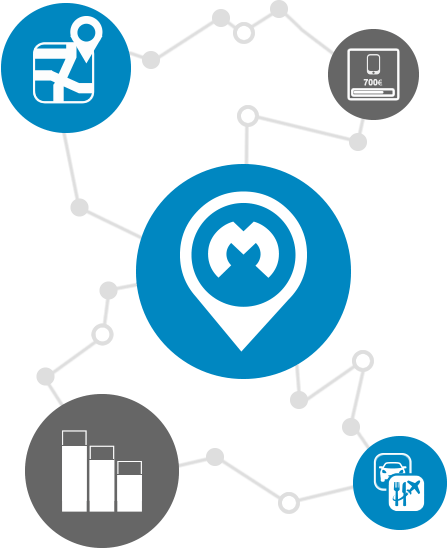 With MoneyMap managing your finances is easy, fast and enjoyable, wherever you are. See a breakdown of your income, average spending and the savings you have made. Group income and expenses together in automatic or personalised categories. You can even create new sub-categories. For each category, see the amount spent over the month and the proportion of total spending. Create your own monthly or annual budget. If you spend more than expected, MoneyMap will let you know. You can even categorise withdrawals and spending in cash: the figures are automatically synchronised. Using Google Maps you can see the shops and brands where you have spent the most using your Fineco credit cards. Where, how and how much you spend. Fully automated. MoneyMap analyses your spending and breaks it down intelligently. Everything is automatic. With MoneyMap, you can immediately have a quick overview of your income, spending, and savings, and you can view your expenses grouped by category. MoneyMap groups your expenses by merchandise category. So you know how you spend your money right away. MoneyMap groups your expenses by the trademarks where you make your purchases. MoneyMap localises all your card payments made over the last 90 days. If you prefer, MoneyMap can set a budget for you,monthly or yearly, setting spending limits for each category. You can categorise your cash payments and withdrawals to gain more control over your expenses. You can tag each movement and localise categorised cash payments. Never again, with our budgets and maps. 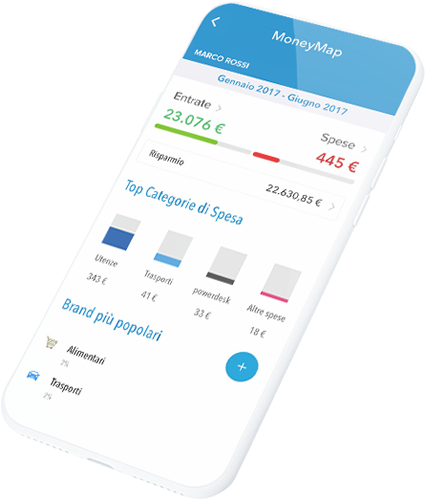 With MoneyMap you can set a budget, monitor your spending using Google Maps and use a range of other tools to keep your portfolio under total control. You can choose between monthly and annual budgeting and set spending limits for every category. An automatic alert tells you when you exceed the set amount, so you can quickly adjust your spending. Set up reminders and descriptions for your transactions and see where your money goes, straight from your smartphone. If you like, MoneyMap can build an automatic budget for you based on your spending over previous months. If you don’t agree with the assigned category, you can always switch it to one of the 19 categories available. 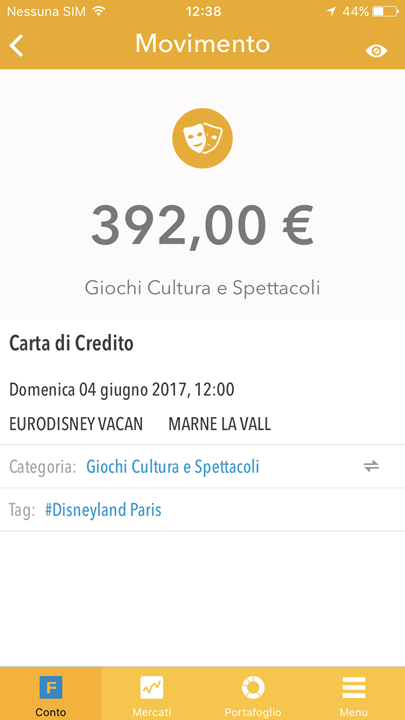 Automatically view a Google map of the places where you have used your Fineco card – in Italy and worldwide. You can decide what information to keep out of your budget. And with a click you can bring them back into view. Only you can see your MoneyMap information. No data is ever shared externally. So you can rest easy. have been Fineco clients for at least 6 months. In all cases, applications are subject to evaluation by Fineco, which reserves the right to refuse to issue the card, even if the above conditions have been satisfied. The cardholder must be resident in Italy and at least 10 years old. Fineco Card Credit, Fineco Card Debit, Reloadable, Extra and Gold. Carta Extra revolving option: Nominal fixed interest rate 9.95%. E.g. : Withdrawals and purchases of €2,000. Total interest €207.14. Card and PIN sending charges €1.90. Full refund of €2,209.04 in 24 months. APR: 10.52%, installment amount: €95. Fineco Card Credit revolving option: fixed nominal APR of 13,90%. Example: cash withdrawals and purchases of €1,600 - Total interest due: €179.90 – Card annual fee: €19.95 – €18.29 (rebate)= € 1.66. Total repayment due: €1,781,56 over 18 months. Effective APR: 14,94%. Repayment amount €100.